Finger Puppets for a Long Haul Flight – will they save our sanity? As you may or may not know I grew up in Australia, but all of our family still lived in England. Most years we flew from Australia to the UK and this was in a time where there were no individual televisions in the back of the seat in front and certainly no iPads to keep us amused! For each flight Mum used to pull together loads of really exciting stuff for us to do on the flight. She would pack our in-flight bags and we wouldn’t be able to open them until we had taken off and the pilot had turned off the seat belt sign! I can’t really remember what she packed for us, but I remember being so excited and loving all of the things that she had found. I have a long haul flight (UK to Australia) with two little ones (Charlotte is now 4 1/2 and Emily is not long gone 2) coming up soon and have been thinking about what to pack to keep them amused. Lucky for us we will have individual televisions in the back of the seat in front and even more fortunately for us we will also have an iPad. I was thinking, however that the iPad battery will only last so long and that 24 hours of non-stop Peppa Pig can’t be good for anyone. With that in mind I have been pulling together a list of ideas of what to take with us on the plane to keep them amused. The last time I did this trip I was newly pregnant with Emily and Charlotte was about 20 months old, so my list of what to pack will be radically different to last time. One idea that I had was some little felt finger puppets. They are small, light, cute and will give an opportunity for some imaginative play and a break from the monotony of flying such a long way. 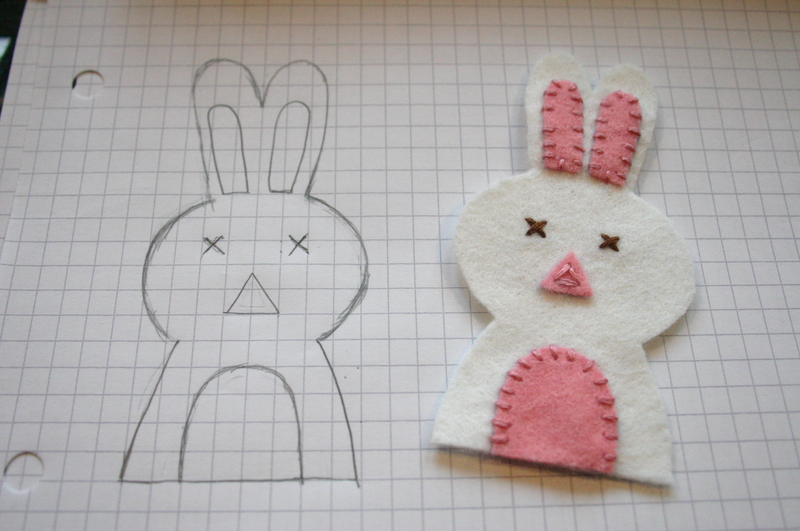 This little bunny was first to be designed last week (when I should have been finishing off something else). Isn’t she sweet? Charlotte loves her, but I am hiding her away with a few friends so that they are a surprise when she finds them in her in flight bag. Have you had experience of flying with two young children? How have you found it? Have you got any great ideas as to what I can pack that will help keep them amused?